By the end of the Second World War, airplanes were going higher than ever before, resulting in extremely dangerous ejection conditions for the pilots. John Paul Stapp, a USAF Colonel and physician commenced a career of research in aerospace safety, providing solutions to prevent high altitude ebullisms, bends and dehydration. In 1954, as part of his rocket sled research on rapid deceleration, he reached the limit of human endurance on a railed track – travelling to a top speed of 1017 kilometer per hour, inflicting upon himself a 46.2G force on the bare framed Gee-Whiz, a rocket decelerator sled he designed. By then hailed as The Fastest Man on Earth, he survived these self-inflicted tests with cracked ribs, twisted wrists, damaged eyes and much more. This nearly-fatal feat launched a whole new era in aerospace safety: the test limit for fighter aircraft seats was increased to 32G, a “side saddle” harness was invented for pilots, and passenger restraints were tested. His life was devoted to pioneering human safety in vehicles. Perhaps it was a fitting tribute indeed when Art Thompson, program director of Red Bull Stratos, proposed the name G-Whiz for the wrist worn device that could potentially save the life of Felix Baumgartner during his fall from the stratosphere. The G-Whiz would trigger a high-speed emergency drogue parachute in the event of an uncontrolled flat spin. Felix Baumgartner eventually went on to break the sonic barrier without having to use the G-Whiz, as he came down to the Earth in free fall in October 2012. Space Safety Magazine reached out to Art Thompson to discuss the advancements to spacesuit design brought by his work on Red Bull Stratos. – a video on John Paul Stapp’s extreme experiments to acquire data on the human body’s ability to withstand extreme forces including rapid deceleration, exposure to high speed winds and other hazards associated with jet aircraft. 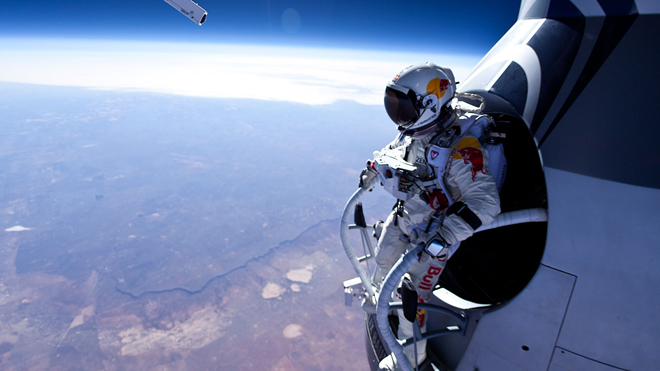 Even before Project Stratos, Felix Baumgartner was an accomplished skydiver and BASE jumper. In search of a world record, Stratos was initially conceived as a skydiving stunt, designed primarily to break the record set by Joseph Kittinger’s high altitude jump in the 1960s. And with Red Bull as his sponsor, he eventually did just that. Art Thompson is an eclectic designer, with more than three decades of experience in innovative design in the aerospace industry, including development of the B-2 ‘Stealth’ bomber aircraft, for example. Today, he is VP of Sage Cheshire Aerospace, Inc., based out of Lancaster, California. And it was his team that was responsible for bringing Felix back onto Earth safe and sound. It was 18:00 GMT, on 14 October in 2012, and about 8 million people worldwide were witnessing Felix Baumgartner’s record setting jump live. At 18:08 GMT, he made a salute, and dove forward into what was his highest jump yet. A few minutes before the jump, Joe Kittinger, now Baumgartner’s mentor, radioed him for the last time: “Start the cameras, and our guardian angel will take care of you”. Just another day in extreme sports sky diving, maybe. But it was a monumental day for the scientific flight test program that Stratos really was. A lot of unprecedented records were made with this jump. More importantly, it was the first time ever that physiological data was captured from a human freefalling at supersonic speeds. He reached Mach 1.25 on that day, exactly 65 years after Chuck Yaegar broke the sound barrier in a piloted flight. This was a privately funded program, a far cry from the government and military programs of the last century. Art Thompson is quick to point out the importance of private funding here. He explains, in essence, that it is our quest for adventure that drives us as a society towards exploration and progress. A public interest, aided by the support of private industry is what will propel our future in space exploration. And he has proof for just that: he led the Stratos team in convincing Red Bull, an energy drink company with no interest in space science, to invest in scientific exploration. It was a negotiation forged on common grounds: adventure. Red Bull has had a brilliant long-standing PR campaign, associating itself with extreme sports and adventure. It doesn’t take much to see why having a human jump from the stratosphere, to probably break sonic velocity wouldn’t be the same. He remains of the strong opinion that a public wish to experience the feeling of space – when it manifests itself into a growing space tourism industry, fueled by private industry support – will be the gateway to our future in space. Baumgartner prepares to jump from his capsule on his last test flight (Credits: Red Bull Stratos). At first glance, we see that the stratosphere bridges a gap between being Earth bound, and going into outer space. This would make the stratosphere, as compared to orbit, the more accessible and economic choice when it comes to scientific studies. Apart from altitude, speed is another important factor. Going to orbit requires reaching the so called ‘orbital velocity’, a speed at which centrifugal force equals gravitational attraction. This speed is not required for a balloon reaching up only as high as the lower stratosphere. And this is exactly the rationale that inspired the pre-astronauts and today’s manned stratospheric balloon flights. That said, it is still an extremely inhospitable region. Biologically, we just do not belong up there. Temperatures often as low as -80C and an ambient pressure that rapidly decreases with altitude makes for an extremely forbidding environment. It has strong winds, sometimes exceeding 300 kilometers per hour. For these reasons and more, the stratosphere remained the home only of weather balloons and spy planes for a long time. Yet, disregarding all this hostility, Thompson and his team have still managed to get humans up there in the name of space exploration and adventure. This wasn’t the result of blatant ignorance of the elements, but rather a very pragmatic and meticulous approach towards human safety. Yet, with due consideration to all the inherent dangers, the stratosphere is about as close as one can go to space, and is still not as inhospitable as outer space itself. It is because of this relatively economic location that it becomes prime testing grounds for future space applications. A fact that has remained true for the last century, ever since manned balloon flights came into being. “Long before the Columbia and Challenger tragedies occurred, way back to the pre-astronauts when Joe Kittinger made his jump from 102,800 feet, there has been an interest in how to protect life in space”, explains Dr. Thompson. When Red Bull approached him to take up the role of technical director for Stratos, he was clear about one thing: that the project would be a flight test program with an obvious scientific and technological mission. Almost all manned stratospheric flights so far were in the name of progress in space science, always further testing the limits of humans in an inhospitable environment. It comes as no wonder then that historically, they are seen as a precursor to the space age. There was Project Manhigh, a series of three high altitude balloon flights in 1957 and 1958. Established by the US Air Force, this project sought to test the effect of cosmic rays upon humans. It was here that the first ever recruitment process for space age pilots, a barrage of tests assessing human limits, was created. In parallel ran Project StratoLab run by the US Navy, which made use of an open gondola in its fifth and last run. In contrast to Manhigh, which used innovative life support systems and a new capsule design, StratoLab retained design elements of the gondolas from the 1930s. Project Manhigh slowly evolved into Project Excelsior, where Joe Kittinger, the pilot from Manhigh 1 would become the first human to free fall in space from the highest altitude – around 30 kilometers. The goal of Manhigh was to place a pilot in a sealed capsule above 30 kilometers for a 24-hour flight. The pre-flight testing at this time was totally unprecedented, with extensive tests on life support system and balloon performances. Dr. Simons, chief project scientist went up in the gondola, in the second Manhigh flight, piloting it for a 32-hour flight in August 1957. Immediately after, the time came for a pioneering step in the road to space flight, the first foray into the entire field of environmental control and life support systems, proving that a human could indeed survive in an uninhabitable environment. The screening tests made for Manhigh 3, eventually manned by Lieutenant Mc Clure were also a first, paving the way for current astronaut selection procedures. Soon after Manhigh came project Excelsior, established to solve problems associated with high altitude parachute jumps, in light of dangers faced by pilots ejecting from high-performance aircrafts and the emerging space age. This was the dawn of human space flight research. How could one provide astronauts with a safe escape method, even while within the atmosphere? In the absence of stabilization, a human ejecting from an aerospace vehicle at high altitudes could enter flat spins of 200 rpm, fast enough to knock the brains around dangerously and send the blood rushing into the limbs. One only has to see a few first-person-view videos of skydivers in the air to get an idea of the dangers of such undertakings. A flat spin is disconcerting enough when watched from afar. Imagine the same happening as one falls uncontrollably in freefall, from an altitude of 30 kilometers or more, and then, you might just comprehend the dangers involved in stratospheric jumps. Simply put, the centrifugal force from flat spin results in blood rushing to the extremities. This could render the diver unconscious, and even cause massive brain bleeding and clotting. Depressurization could cause the body to swell up in seconds, and this was what occured in 1960 as Capt. Kittinger jumped from an altitude of 31 kilometers. When his glove failed to pressurize properly, his hand swelled to twice its normal size on descent. 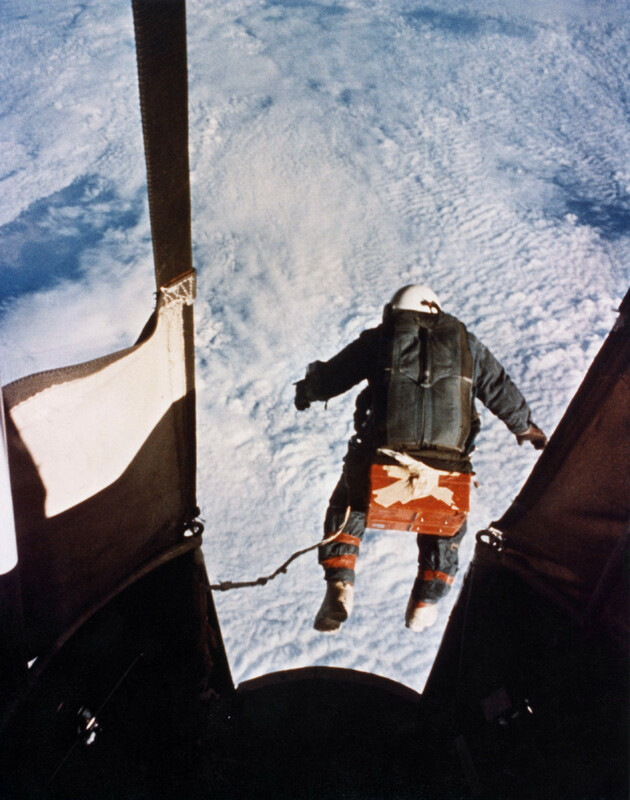 With only a pressurized suit to protect him from the elements, Kittinger made his “long, lonely leap” from 31 kilometers in August 1960, in free fall for over 4 minutes. And more recently, Felix Baumgartner rose up into the stratosphere in a pressurized cabin, while Alan Eustace did so hanging from a balloon, with only a pressurized suit. The importance of pressurized suits in space and high altitude flights cannot be understated. It is, in its barest form, a life or death situation. With a burgeoning space tourism industry today, this is a difficult question that private enterprises are trying to solve: Are pressure suits really necessary for paying customers? The next installment in this series will attempt at discussing the advancements made in this direction by Project Stratos. Shivaprakash M is a data science enthusiast, currently pursuing a Masters degree in space science and technology, and has a background in mechanical engineering.